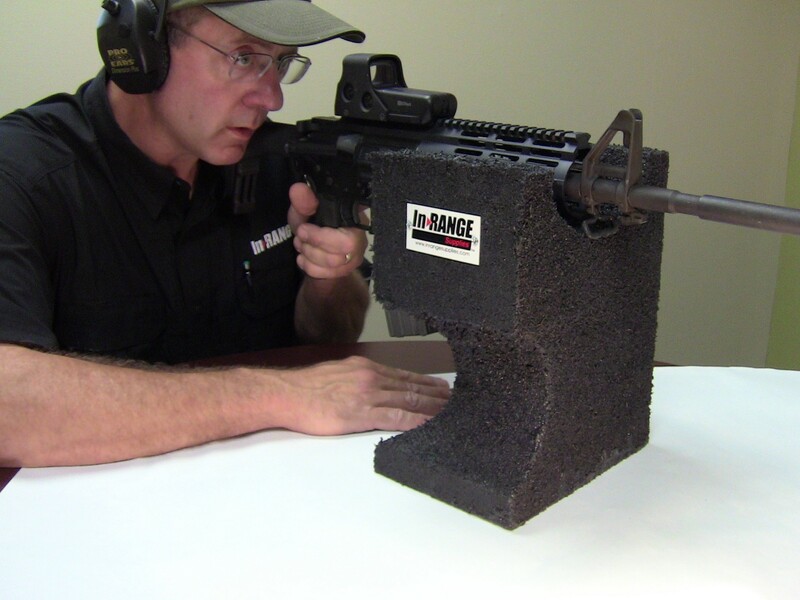 This 14 pound composite rubber block is made of 100% recycled rubber particles. Ever have a sand bag get wet, or start leaking on you. This block will not absorb water and there is nothing to leak out. It will not freeze or decompose. A great tool for outdoor ranges. Demonstrating how the new cleaning tank easily fits in the MTM field box. OK, your at the range and realize that your gun or more likely a clients gun is so gummed up with crud that it will not function. Don’t you just hate wasted trips to the range? The guys at Secure Firearms Products hate those wasted trips too. So they came up with a way to take a solvent tank to the range without the mess and smell in your car. They make these tanks in a couple of sizes. The small tank fits inside the MTM AC11 and AC35 ammo cans. The solvent tank has a seal but just in case it might leak or you spill solvent on the outside of the tank. Just set the sealed thank in the MTM ammo can and seal it up. NO muss, no fuss, best of all no smell. Note the lift out tray so you don't have to fish for parts. Also a great solution for hobby smiths who do not have room for a big cleaning area. This tank can be closed up and put away when not in use making it a convenient and useful tool for any shop with limited space. The lift out trays have hooks built in so they can hang over the tank and allow the solvent to drain back into the tank without spill. In the upper right of the photo above you can see the gasket material that seals the lid to the tank. NEWTOWN, Conn. — The National Shooting Sports Foundation (NSSF) has announced a new program designed to help local public and private ranges increase participation in the shooting sports. The Range Partnership Grant Program is making available a total of $250,000 per year for projects that specifically address one or more of the following objectives: recruitment of new shooters, reactivation of lapsed shooters and increased opportunities for active shooters to try another discipline. The NSSF is especially interested in new, creative approaches to these challenges. Eligible organizations are limited to public or private ranges and clubs, or educational institutions with hunting or shooting sports curriculums and faculty. Grant guidelines and applications are available at www.rangeinfo.org/grants.